Steven (Chicagoland, United States) on 27 January 2010 in Landscape & Rural and Portfolio. This is probably one of my top two favorite photos that I captured along the shoreline of Illinois Beach State Park. What intrigues me is the symmetry that is seen in such a free-form creation. There is nothing underneath all this sand and ice. The straight angles along the top and the icicles make an interesting find. This was probably also one of the largest formations on the beach. While stalactites, stalagmites, and columns are found in limestone caves, all three (pseudo-types) can be seen in this ice and sand formation. 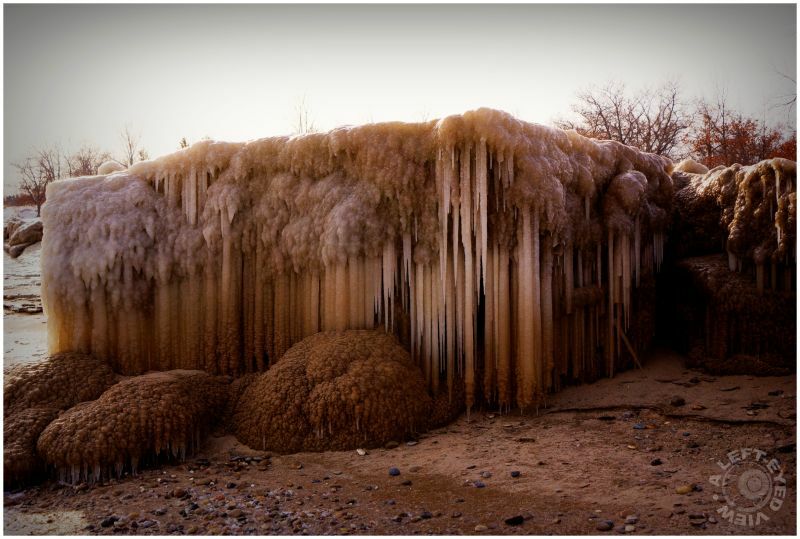 The icicles remain white until they reach the ground and become a "column", at which point the columns seem to bring sand up from the surface, creating the mixed brown and white colors. The three "mounds" of sand in the lower left seem out of place here. Photo captured January 10, 2010. This is amazing! It has got to be very cold for this to happen! Wonderful image and explanation! Very beautiful detail of this amazing landscape ! Love the details here.. AMAZING. Really amazing; dripstone cave in time lapse mode. I really enjoy this series. Thank you for braving the cold and wind to capture and post it. This entire series if fascinating. The textures are incredible. Growing up on the shores of one of the Great Lakes (in Michigan) I've never seen anything like this. One of the most interesting series I've seen here on AM3. Very nice composition. Fine tones. This is a very interesting ice formation.. I had never seen anything like it... Thanks for sharing! Excellent photographs! Great image . Great series ! Wow Steve they really are some sight to see. This is simply amazing - well seen and well captured!!! A table cloth hanging from a large table. This is really beautiful. This phenomenon is a great find. Nice image and intersting formation.